Peace and Great Day. We have some great news to share. In an effort to promote entrepreneurship, we've redirected our focus on educating our audience about the benefits of being a business owner. We've spoken to several people that are fed up with their jobs but, feel as if they don't have what it takes to go into business for themselves. Most feel they don't have the time or capital it takes to open a business. Even more people don't have a clue of what type of a business they would open even if they had the opportunity to. Here at BLAM! we understand that Major Corporations run the world. Also, you can't obtain wealth by working for someone else, in the sense that you can't pass your job on to your children. You may not even be able to get your children hired at your job. If you owned a business however, you would be able to pass your business and it's wealth on to your progeny. To address their complaints however, we want to provide relevant information that will take the fear and doubt out of our audience in reference to becoming business owners. Our aim is to provide effective solutions that will help them see the light. We understand the economy as we know it is due for a big change with the recent advances in technology. Things like BitCoin (digital currency), Self Driving Cars, Artificial Intelligence, and Smart Devices will begin to disrupt the job market and render a lot of people unemployed. Therefore we want to help everyone make a smooth transition into the "Cyber Tech Revolution". The 1st thing we've done in an effort to provide more relevant information about the benefits of being a business owner is to offer FREE CONSULTATIONS via Facebook on Fridays. Our consultations are regularly priced at $25hr. yet, to get more people involved we've decided to offer free advice every Friday. We began this past Friday Nov. 13th. (Friday the 13th) Ha! We were able to assist 3 people with advice. The 1st person wanted to start a business but didn't know where to begin. After chatting with her, we decided that she should begin an online cooking show with a comedic twist. We came to this conclusion based on her outgoing personality and her love for cooking. She's also on social media a lot. The next person we were able to assist, wanted to open an online store but, didn't know where to begin. She also feared that without a budget for inventory or to create a website, she wouldn't be able to do it. We advised her to use sites like Shopify, Amazon, Ebay, etc. To get started. This way she won't have to pay hundreds of dollars for a site. Next we explained to her the technique of drop shipping. This is when you post products on your site that you've discovered for a great price on another site. Once you get a sale, you buy the product from the site you found the product on and have them ship it directly to your client. You make a profit by marking the product up slightly on your site. Then Finally their was a Massage Therapist who wanted to attract more business to her brand. We explain the necessity of marketing her brand like a major brand like we discussed in our Multi-Level Marketing Blog. She decided to schedule another consultation where she would be able to meet with an adviser face to face to discuss more information in reference to marketing her brand. Finally, we've added "Live Chat" to our website in an effort to provide better customer service. This will allow us to answer our client's questions directly from our site. We can provide resources and answers to pertinent questions about our products and services. Our Motto is "We Help You Succeed" and we continue to do just that. Thank you again for following our blog. We Really Appreciate It. 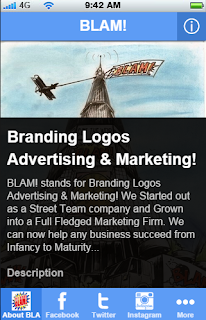 Also, visit our site blampromoco.com today and have a chat. We would really appreciate that too. Thank you. Thank You for Choosing BLAM! We Help You Succeed! #TeamSuccess #TeamBLAM!